I have recently been reminded of the fear that returns when you are being stalked. This is part of my story that I haven’t shared yet. After separating from an Abuser it is the most dangerous time for a woman who has been in an abusive relationship. And once we leave, the stalking begins. What is stalking you ask? Being hunted down with the intent to harm or kill – just like an animal. That’s what it feels like. Your phone starts ringing – 15 times in an hour, you get home from work and there are flowers on your front step with no note, you drive to the store and see his car in the rear view mirror, you wake up in the middle of the night to someone outside your patio door – that’s what it is like. 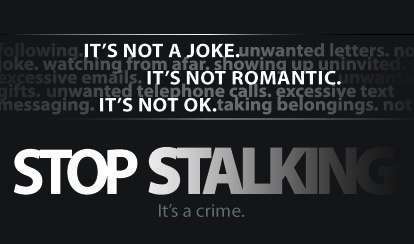 Stalking is contact (usually two or more times) from someone that makes you feel afraid or harassed. So what do we do? How do we make it stop? I wish there were an easy answer to this. That means texts, phone calls, times and places where he has been following you. Get a notebook and carry it everywhere. Make sure your time and date stamp is ‘on’ for your phone. One of the best pieces of advice I got from a Police Officer is that in court the Judge will be looking for a pattern. Be sure to note the date, the time, and the place each incident occurs. There are different types of Restraining Orders depending if you have lived together or not. And it may vary from State to State. I can’t tell you how frustrated I was when I went to court, presented my whole case, and the Judge told me that he would love to grant the restraining order – however he couldn’t because I filled it out the wrong form. He said I would have to fill out the right form, and schedule another court appearance, and THEN he could grant the restraining order. Yeah – really. And be sure to know the terms of your Restraining Order – how far away does the Abuser need to be, can he call, text, whatever. And know how long it is in force. Be smart, use this order to your advantage. Most Shelters have free counselors, free meetings, and access to legal aides. They are on your side. They will help you. I got help with forms, finding local agencies to find a new home, food stamps, bus tokens, etc. They have been through this before. And many Shelters offer free living accommodations for yourself and your children for 30 days. No, it’s not the Ritz Carlton – but it is safe. And they have gates to keep him out! Have an action plan of what to do when the Abuser violates the Restraining Order. Be ready to call the Police anytime and anywhere. Carry your phone with you everywhere you go – even the bathroom, and be ready to call for help. Be sure it is always charged. Remember, the Abuser is in stalker mode now, he feels you are his ‘property’ and nobody is going to tell him what to do. Having a witness goes a long way in court. Be sure to tell your neighbors, friends, family exactly what is happening. This is not the time to keep quiet. The more eyes you have on you the better. And be sure that your ‘friend’ is not forwarding the Abuser information. I have had that happen too. Many times the Abuser knows where you will be and when. Change your routine. Go to work a different way. Park in a different place. Go to a different grocery store. I have had to quit jobs, leave cities, change my phone, etc. No, it was not fair. But it was worth it. Yes, really. It is one way to stop the calls. And do not give this new number out to everyone. I made that mistake once and the Abuser got my new number from a ‘friend’. I got another phone, and another ‘friend’. 8. Change your Locks and install Motion Sensors and/or Cameras. Definitely change your locks both for your house and car. Seriously. If the Abuser still has a key, he WILL use it. Use technology in your favor. These days motion sensors and IP Cameras are very inexpensive and easy to use. Yes, he may break it, but then call the Police – report it. I had left my bicycle outside my apartment. When I went to go to work, I noticed that ‘someone’ had jumped on the back tire and bent it. I called the Police and reported it. They will know who did it, and will most likely catch him doing it again! With Facebook, Twitter, Instagram, and everything else this WILL be an area where the Abuser will ‘talk trash’. They seem to have to prove to everyone their side of the story. And DO NOT RESPOND to them. You have to abide by the rules of the Restraining Order as well. If you talk or respond to the Abuser you may inadvertently hurt yourself. The Police will have a hard time enforcing the order if YOU are the one who broke it. And yes, the Abuser will use it against you. Don’t believe his words – believe his actions! More than likely the Abuser will break the terms of the Court Order. Be prepared to call the Police every single time it happens. You got your restraining order for a reason. And if you don’t have one – get it now! I thought once I had that piece of paper the Abuser would leave me alone. I was wrong. His attempts to contact me or see me INCREASED! I don’t know why this surprised me. But the Abuser is after control – of you. And in their mind they ‘own’ you. Hearing ‘NO’ from a Judge or Police Officer will often motivate the Abuser to break that rule! They don’t hear the word ‘NO’, they think ‘Yeah right, who are you to tell me what to do?” Use this to your advantage. Be ready. Be safe. And Be well. Here is the post that reminded me what this was like. THE FEAR: my stalking abuser is back. Posted in Activism, Boundaries, Domestic Violence and Abuse, Uncategorized and tagged Abuse, Court Order, Domestic abuse, Domestic Violence, Domestic Violence Awareness, fear, Police, Police Officer, protection, Restraining order, Restraining Orders, stalking. Bookmark the permalink. This is so true. You got it. Abusers do not want to lose control and stalk you after you break away. It is frightening and so misunderstood. This is excellent advice for all. Thanks Diana!! I will reblog this! Another great post, all of which is so true. Very informative. I can’t stress enough the importance of not engaging in communication with the abuser and calling the police. I had a friend who kept trying to reason with her abuser and it never ended well. The police can/will only help as much as we allow them to intervene instead of attempting to negotiate with our abuser. Thank you again. Thank you so much for sharing this information with us. I hate that you have been through it all, but love how you are using it to help others. God bless you and keep you and cover you! Awesome post!!! Blessings to you my sister!! And you Angel, what a journey!